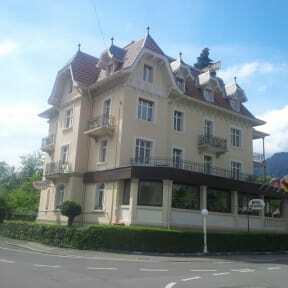 Hotel De la Paix i Interlaken, Schweiz: Bestill nå! Our BACKPACKER FLOOR is on the top 4th floor, the lift goes to the 3rd floor only. 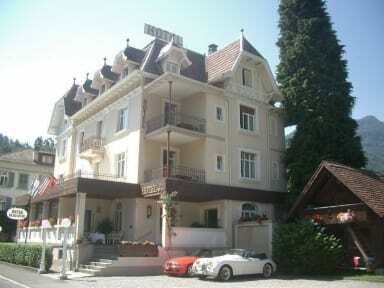 We are a 3-minute walk from the shopping centre of Interlaken and the railway station 'Interlaken West'. All international / airport trains stop at this station. You have connections here for excursions up to the the mountains, buses to the surrounding villages, to the golf-course, and boats for Lake Thun. The hotel has its own car-park - important in Interlaken. Free of charge. A lift, a coin-operated laundrette and an ice-machine are also available. The backpacker floor has a microwave and a refrigerator to share. A growing feature of the de la Paix is the collection of antique clocks which grace the lounges and the dining-room. Our emphasis is on personal attention - we will be pleased to help you plan your next excursion. We are small and special, so don't wait too long to reserve your room! We look forward to welcoming you next summer! Family Etterli. Check In: 12.30 pm until 10.00 p.m. only!! NO LATE check-in possible!! Method of Payment upon the arrival: Credit Cards, Maestro Card or Cash. Breakfast is NOT included. Breakfast buffet CHF. 10.00 extra per Person. Taxes are NOT included. The tax is 3.50 CHF/person/night.